Growing up is a big challenge for the musculoskeletal system. The Physios at Linkfield Clinic manage conditions that affect our younger population. Sever’s Disease is a common condition we can help with. What causes it? Activity related heel pain in adolescents is often due to a difference in the rate of bone growth in relation to the muscles and tendons. The unit of muscle and tendon inserts on to the cartilage of the bone and this area can be susceptible to traction injury. As the bone grows the muscles and tendons have to adapt. 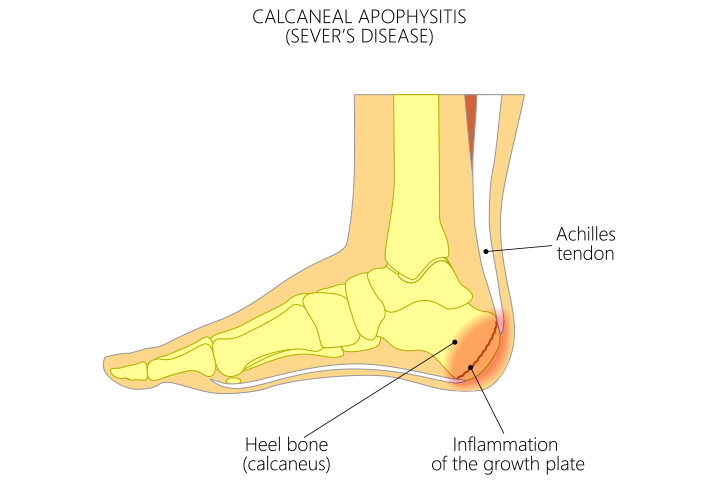 The growth plate (apophysis) becomes inflamed and painful. Who does it affect? The average age is 10 years old. It tends to affect boys more than girls. Can Physiotherapy help? Yes. We can guide you on activity modification, footwear and provide a rehab programme that will help alleviate symptoms and manage the condition. Running will always be tiring, but we can help make it less painful!